Every once in a while I come across information that I feel everyone should know about or at least become aware of. However, the information is too extensive to just put in the ‘Tip’ part of my blog page. The following is just such information. Just about every person in the world has a Microwave Oven. You can’t buy a house without one being included. You are bombarded with TV ads, magazine ads etc. about how to make cooking your food fast and easy. In fact – in the past 30 years microwave ovens have practically replaced the traditional methods of cooking food. This is because there are so many people on the go, barely stopping to eat, that is, unless the food can be cooked in 2 minutes or less. The grocery store shelves are loaded with “instant cook” food, packaged (just add water and stick it in the microwave), and/or frozen, which you don’t even need to thaw out first. Microwave oven’s today, will even thaw frozen foods, such as meat, out for you to supposedly save time. Just the other day I was asked if microwaved foods were really not good for you. And, if so, why not? Here is what I found out. You can check it out for your self. “The microwave radiation deforms and destroys the molecular structure of the food – creating radiolytic compounds. When microwaved food is eaten, abnormal changes occur in the blood and immune systems. These include a decrease in hemoglobin and white blood cell counts and an increase in cholesterol levels.” Just that information alone should be enough to scare the living daylight out of a person (an expression used in the good old days). There was an article in Pediatrics journal warning that microwaving human milk damages the anti-infective properties it usually gives to a mother’s baby. How many of you are or have been guilty of warming the baby’s milk in the microwave? And, you wonder why your child is sick all the time, is susceptable to every flu bug that comes along? I am sorry, I just have to say it the way it is. There were studies done at the University of Warwick in Great Britain that warned, “microwave radiation is damaging to the vital electromagnetic activity of human life vibrations.” This is scary stuff. I am as guilty as the rest of you who got caught up in the microwave revolution. I find that the older generation – seniors – are still caught up in it as many are heard to say, “I just don’t feel like cooking,” “if it weren’t for my microwave oven, I probably wouldn’t even eat.” I do have a microwave (it came with the house). I very rarely use it. The food cooked in a microwave, and eaten, is dead food with no nutritional value – but it does fill you up and take care of your hunger pangs. The question I ask myself and you should be asking yourself is – do you want to die of radiation poisoning at your own hand? Isn’t that considered to be suicide? It just takes longer than if you were exposed to radiation by an atomic bomb blast. My solution – a convection oven would be much safer. Might take a little longer to cook with, but is MUCH SAFER.! I own a NuWave oven. 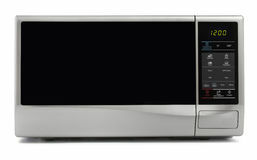 It cooks food as good, if not better, than a microwave oven. Also you don’t need to thaw the frozen meats or anything else before you cook it. THIS IS FOOD FOR THOUGHT – A LOT OF THOUGHT!